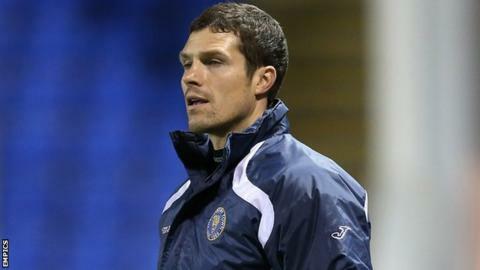 Shrewsbury have appointed Mike Jackson as manager until the end of the season. The 40-year-old has picked up two points from his four games as caretaker boss of the League One side following Graham Turner's resignation in January. Shrewsbury chairman Roland Wycherley said confirming former defender Jackson in the role would ensure "continuity and stability". "It's an honour - I've worked long and hard to get to this point," Jackson told BBC Radio Shropshire. "It is a privilege to be given the opportunity, to take it to at least the end of the season. "It gives us more time to work with the players, and to achieve what the whole club is trying to do, which is stay in this division." Jackson, a former Crewe Alexandra, Bury, Preston North End, Tranmere Rovers and Blackpool defender, has been with Shrewsbury since signing as a player in 2008. He was initially appointed for three matches, and then given a four-game extension, after which he enlisted former Bradford City, Wigan and Walsall boss Chris Hutchings as a coach. On-loan striker Tom Eaves, who helped secure Jackson's first point in temporary charge with a last-minute equaliser against Brentford earlier this month, says the Town players are in favour of the rookie manager getting the job. "Michael was the closest match to the profile the board set for the position," said Wycherley. "He is certainly highly qualified. holding all professional coaching badges including a UEFA Pro Licence."